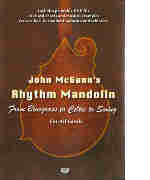 Introduces you to a broad range of grooves and approaches available to mandolin players in bluegrass, old time, Celtic, swing and jazz. Includes: exploration of the fiddle tune "Forked Deer" in many styles, tone production and dynamics, bluegrass rhythm styles, old-time feel with open drone strings, partial chords, the "continuum" right hand in progressive bluegrass, Celtic rhythm styles, the flow/brush/texture, alternate vs. crosspicking, jigs & reels, swing rhythm styles, Texas "sock" style, blues in C extending the I IV V basics, more. Includes printable standard notation/tab file as a PDF.